Fhope door packing machine is a series which has been designed by Fhope’s best engineers and designers. This series is for modern door industry and it utilizes in achieving special packaging goals for manufacturers in door industry. The machine makes perfect package to prevent the products from abrasion, friction, scratch,dust and water during storage and transportation. 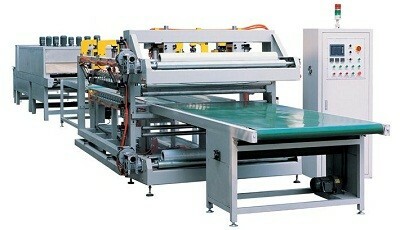 Easy operation and high efficiency are the main factors to the machine’s popularity. Our reasonable price also made the machine become an accessable solution for the customers. Our rich experience helps us to have the opportunity of covering many scales of industrial products companies. We will try our best efforts to assist with your projects. ■ Flooring industries (parquet, laminate, cork, and solid wood). ■ Moulding industries (panels, strips, and solid wood). ■ Kitchen and bathroom industries. ■ Board industries (bench, ceiling, wall boards). ■ Door and window industries. Fhope door packing machine can utilize shrinking, orbital wrapping and spiral wrapping with together, and can producehigh packing efficiency and good packing states of your products. Ideal for straight objects applications. Adjustable packing width to fit different products sizes. Door packing machinery can be equipped with our packing material automatic cut-off and refeed option which can do automatically cutting, feeding and continue to work without operator's intervention. 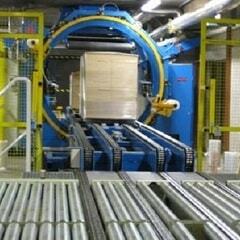 Door shrinking machine is consisted of conveyors, panel bagging machine and shrink tunnel. Easy to accomdate different products, providing a better protection and having a better appearance. The door panel first will be covered with plastic film and after that the heat blade will cut and seal the edges of the package. The bagged panel then will be sent into the hot tunnel for shrinking. The package will be very tight and neat after shrinking process. Two vertical press rolls are used to press the two sides of the panel after shrinking and make a tidy edge. This tight and neat package can be a selling point for the manufacturers. Three sealers fixed on the machine, instantly cut and seal three sides of the package before going into the shrinking tunnel, greatly shortened the time. The wholly sealed package does a better performance in protecting your products. Packing material: PE/POF/PVC film with reserve pore. Packing material: PE/POF film with reserve pore. 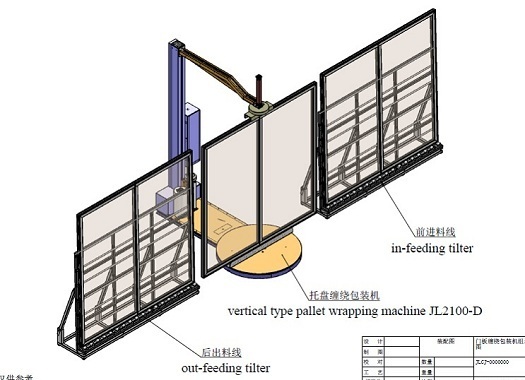 Door horizontal wrapping machine is designed for packaging the product through stretch wrapping. 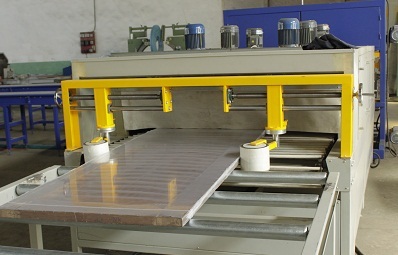 Stretch film will be used as the packaging material to wrap the door panel and the machine is controlled by the control system. The setting is changeable and can be operated by users themselves. Different packaging methods such as overlap rate control, over wrapping on front and rare parts, bubble film covering are achivevable as well. Below are specification of the different machines. 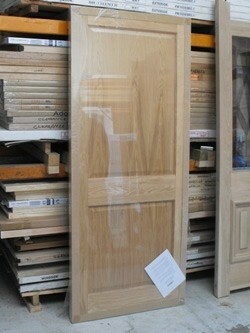 It is able to work for different door packaging. No matter what length, weight and size problem, Fhope Pack makes solutions as your need. 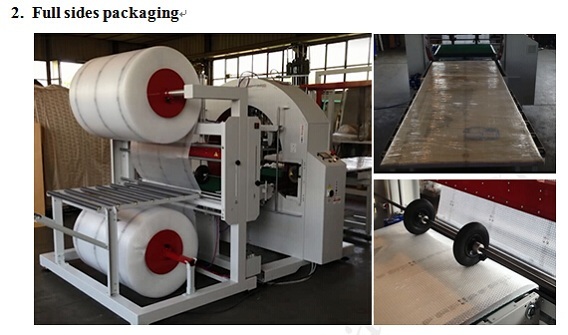 The packaging solution= film covering machine + wrapping machine + out feeding conveyor. It's a stretch wrapping solution providing better protection for your door with full size packaging. The film covering device adopts PE film, bubble film. And, cut film by sealer. It a a stretch wrapping solution providing a better protection for your door with full size packaging. The film covering device adopt PE film, bubble film which cutting film by sealer.